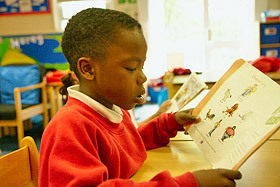 At Star Primary we aim to instil a love of reading in all our children. Our rich curriculum introduces children from an early age to classic children’s literature and firm favourites such as The Gruffalo, Treasure Island, Midsummers Night’s Dream, Oliver Twist and The Iron Man. Quality texts form the foundation of our learning at Star enabling our children to read widely and often. We work in partnership with parents through our Home Reading Programme to ensure that all children learn to read confidently and fluently; all Star Pupils from Nursery upwards bring a book bag to school every day and leave with an age appropriate book to read at home. During school time we aim to listen to individual children read daily and will write comments in their reading log to support their reading at home. In addition, children have Guided Reading sessions taught by their teacher where the skills required to understand and comprehend texts are taught alongside reading with expression and fluency. To nurture a love and enjoyment of reading both in school and at home, Star Primary have acquired a reading programme called Bug Club. Bug club is an online resource, where children can access eBooks allocated by their class teacher. Each book has questions about their reading to support their understanding. Each right answer earns them ‘Bug Points’ that they can “spend” in their learning area. They do not need to finish all the quiz questions in one sitting and can come back to a book later. By reading more books, your child will earn enough points for a reward. When your child has finished a book, it will move to ‘Books I have read’ (for KS1) or ‘Look again’ (for KS2). Once their virtual book bag runs low, your child’s teacher will be able to assign more books for your child to read. If you have any technical problems, have misplaced your activelearn log in details or need more books, please speak to your class teacher. We hope that you and your child will love these books and enjoy reading them at home. At Star Primary it is our aim to ensure children are competent and confident readers and writers by the time they leave year 6. We begin this process from nursery through the rigorous teaching of phonics! Phonics is the first step in supporting your child to read and write. During our daily phonic lessons children are taught to listen, look and distinguish between the different sounds.